Last year, Tony and I attended Fox Cigar Bar’s Foxtoberfest in Gilbert, Arizona. It was an awesome event where we had opportunity to hang out with BOTL/SOTL and meet several cigar manufactures. Well, the 2013 Foxtoberfest has been scheduled and will take place October 19th. And yours truly will be in attendance. If you are in the area or don’t mind making the drive, Tony and I would love to meet you. For more information on the event, check out the Foxtoberfest website here. Now onto the review. 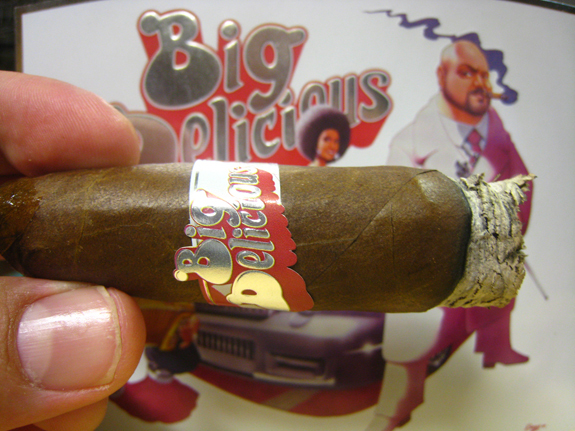 The Big Delicious sports a beautiful, consistent, oily, milk chocolate wrapper that is silky smooth to the touch. I have not encountered any soft spots on this evenly packed cigar. The aroma off the wrapper is light with mild pepper and leather. One thing that immediately grabs you about this stick is the crazy shaggy foot. However, due to the shaggy foot, I am unable to pick up on any additional notes off the foot. The cap has been applied extremely neat looking like an extension of the wrapper. Taking a small clip off the cap, a perfect draw is revealed. The back of my throat is tickled from pepper on the cold draw and rich tobacco hits my palate. Toasting the foot of the Room 101 Big Delicious took some time due to the shaggy foot and the large ring gauge, but I am now under way and I am really looking forward to this cigar. 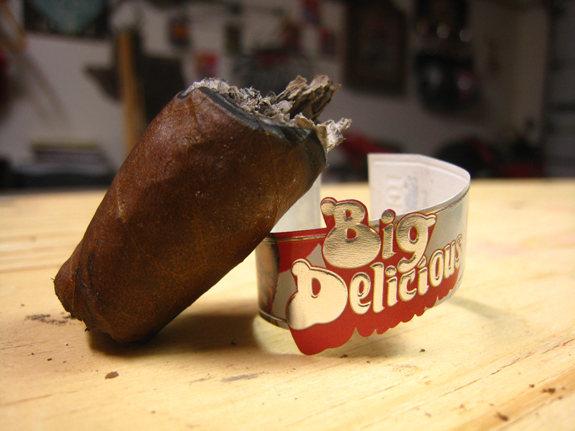 This is a hefty cigar but the soft box pressed format makes it very comfortable in the hand and while smoking. The smoke is delivering flavors of leather, earth, pepper and a very enjoyable tartness. The spice is felt across my entire palate. 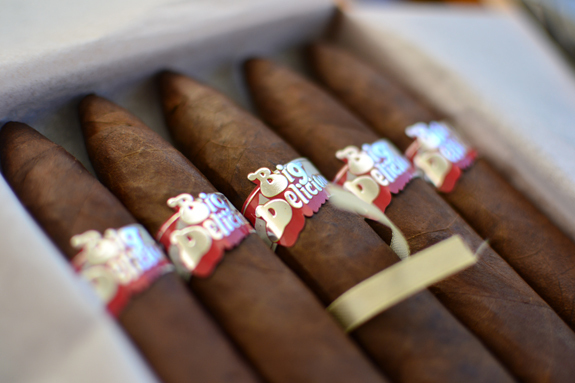 Retrohaling the cigar showcases a sharp spice of white pepper and woodsy notes. Already the profile is transitioning with an added layer of oak. The burn started off a little edgy but is now even with a thick eyeliner burn line. I am loving how slow the Big Delicious is smoking. 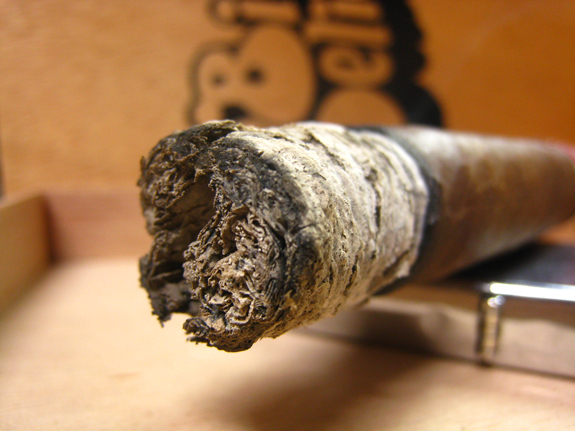 It took about 30 minutes before the first ash fell off about an inch and half into the cigar. The flavors and strength are a steady full. The leather quality, which I usually associate with Honduran tobacco, is still around with a vegetal flavor that is somewhat musty. The tartness is something I have rarely picked up on and I am not sure which type of tobacco delivers it but it is tasty. It is similar to the tart side of a SweeTART. A caramel richness is showing through but not overly sweet. I clipped the cap a little deeper, not due to draw resistance, but the amount of smoke was not to my liking. The deeper cut has significantly improved the amount of smoke each puff delivers. The smoke is cool and balanced. The retrohale it still in your face with the spice and pepper. I am really digging it. The strength is full but comfortable, giving me a nice relaxed feeling. Once again the ash is holding strong. While not the prettiest ash, it is solid. A sweetness that was barely poking its head out earlier has now arrived complementing the tartness in the profile. While not a lingering sweetness, it does hit the tip of the tongue on each draw. The sweetness is fresh, almost fruit-like. The earth and leather notes are now much darker, with an added savoriness. 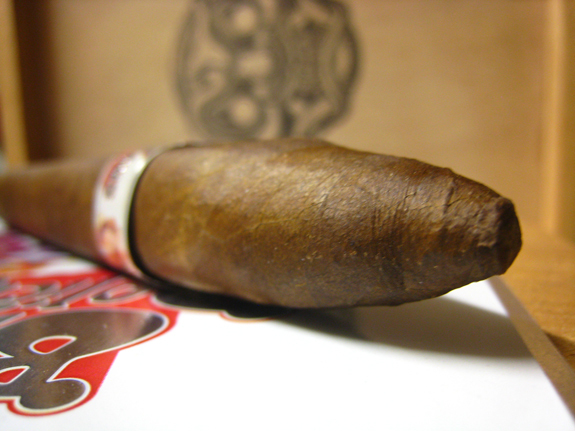 In the final inch and half, a toasted dough-like flavor has entered the profile with a cocoa finish. Smoke is just pouring out of this puppy and copious amount of smoke fill my mouth with the smallest draw, leaving an oily coating on my palate. The sweetness continues to evolve incorporating a caramel richness. 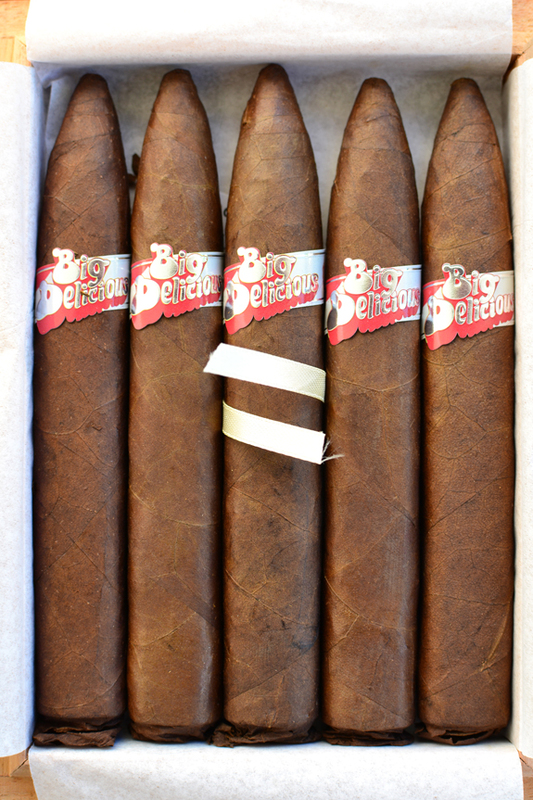 This cigar just keeps building and evolving. Finally reaching the band an hour and 25 minutes in, I remove it with ease. 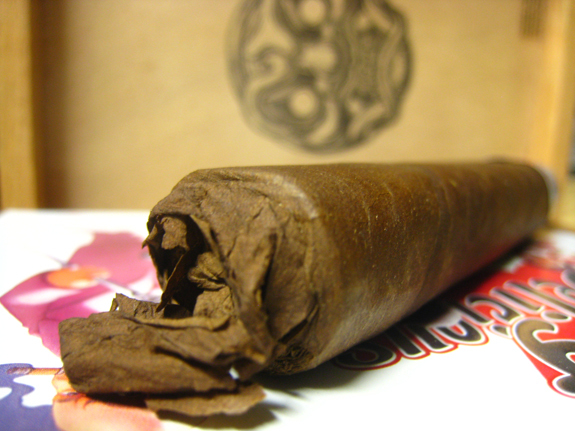 The flavors remained a steady full throughout the entirety of the stick, while the strength moved up a notch making this one powerhouse of a smoke at the end. To sum it up, I feel privileged to have smoked this stick prior to its release. The Room 101 Big Delicious captured me and took me on a crazy, amazing journey for an hour and forty-five minutes. The flavors engaged my palate and challenged me and not once did I lose interest in this cigar. The construction was excellent and even the large size was comfortable. 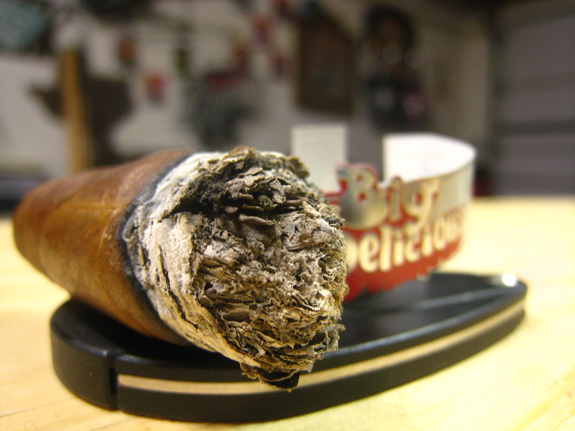 This is one smoke I could easily recommend to any seasoned cigar smoker out there. Now at the price of $44.75 for a five pack, I think it is a steal. 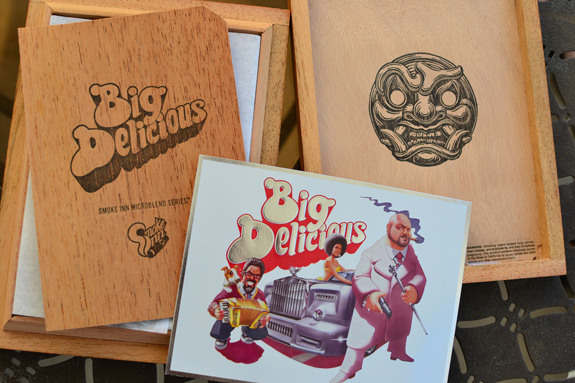 The Big Delicious can be pre-ordered at Smokeinn.com and the cigars will ship on April 29, 2013. Get your hands on this gem before they are gone. And trust me, these sticks will be going fast. Thanks for the Great review Jeremy!! Stick sounds awesome, might have to order some of these, sweet box, do you know if that was packaged specially for blogger review or will all 5 packs be sold like that? The Smoke Inn website shows a five pack in the same box, so it looks like that is the way they would come, although I could be wrong. Jeff is correct. All the five packs will come in the same box and crazy, awesome presentation. Man, I was blown away by the presentation when I received these bad boys. Thanks, guys, for checking out the review. And if you get your hands on the Big Delicious let us know what you think. Sounds good, but the presentation… Holy Blaxploitation! lol Great review, Jeremy. Hahaha!! So true. The presentation had the adult film vibe to me. But I think you nailed it with it being Blaxploitation. Yup, straight off the cover of “Super Fly”.